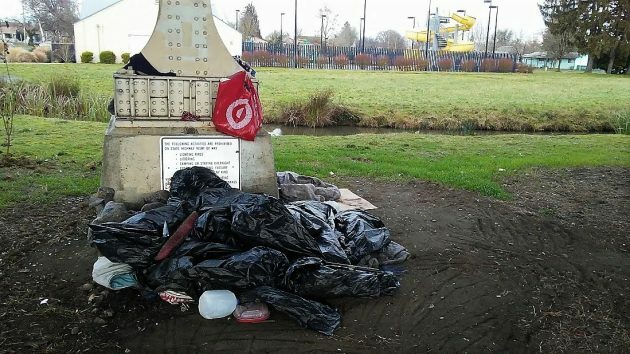 Trash left by vagrants waits to be picked up under the Pacific Boulevard viaduct one day in January 2018. As it did when both ordinances were up for the first time two weeks ago, the council listened to residents on the east side of central Albany. They told stories of being harassed and having their properties invaded by vagrants, drug users or thieves. Others said the city can’t hope to solve the problem with punitive laws but must do more to try to help struggling people find housing and jobs. As of now, camping is banned on sidewalks, streets, alleys, lanes, any public right of way, park, or any publicly owned property under bridges and viaducts unless the city allows it in emergencies. What happens to violators? The ordinance doesn’t say. The other ordinance sets up an “enhanced law enforcement area” stretching from the Willamette River south to Pacific Boulevard, Albany Station and 11th Avenue, and from Elm Street on the west to Pine Street on the east. According to the police, the zone covers 5 percent of the city’s land area where 19 percent of Albany crime is reported. If someone is convicted of three offenses within the area over six months, the city judge may ban that person from entering the area for a period of from three months to a year, with exceptions for visiting places like Mental Health or other offices. Someone caught violating such an exclusion order is to be arrested on a misdemeanor charge of “persistent violation.” That could entail jail time. Councilor Bessie Johnson voted for the exclusion ordinance but was uneasy with it. She requested and got an assurance that in six months, the council will review how the law is working out. Mayor Sharon Konopa welcomed the new laws as tools to get people to change. She also challenged critics of what the city has been doing about homelessness to join her in another “conversation” on what more could be done. To respond to the comment about jobs. There are many local companies in Albany that hire felons (certain criteria apply). However, they cannot hire enough employees. This is a real issue with local businesses. It would be helpful to provide more of a connection to those who are recently released from prison and potential employers. Lack of employment is one of the several issues that impede their reformation. This is the United States of America. Has Madam Mayor ever heard of the ACLU…The American Civil Liberties Union? I think not, as she, in her naive way, wants other cities to ban people with a record of crimes or city code violations (watch how you park, folks!) from their downtown areas, just like Albany does. This new Enforcement Area is unbelievable? Is this Nazi Germany? Oh, how could I forget….it is Trumpville. Right…lookout Albany (and Philomath) !! Posting on the GT website about ODOT clearing Corvallis homeless camps. Good thing there are so many ODOT employees. Ha. A ban on people ? How can you ban humans but not guns?? I understand that it doesn’t feel good to see homeless people or to deal with vagrancy related issues but it’s really sad to me that when you become homeless…you literally have no place to legally go if you aren’t in a shelter. Rather than finding solutions to aid in our homelessness crisis (Oregon is the 2nd worst state in the U.S. in dealing with this crisis) we are passing laws that will only make it harder to survive if you are a homeless person. We just keep shuffling and skirting around the issues surrounding the lack of resources and access to affordable adequate housing. The numbers of homeless continue to rise and I don’t think its going to get better by some of these restrictions although I understand the basis for them as well…such a tough situation. More than restrictions need to be done though. We need to find solutions for everyone.